Constructed with the same thermally fused, commercial-grade melamine interior found in all their cat townhouses, The Cat’s Inn’s hardwood trim cat townhouses offer a great look and high quality of comfort for cats at your clinic or shelter or for any other boarding needs. 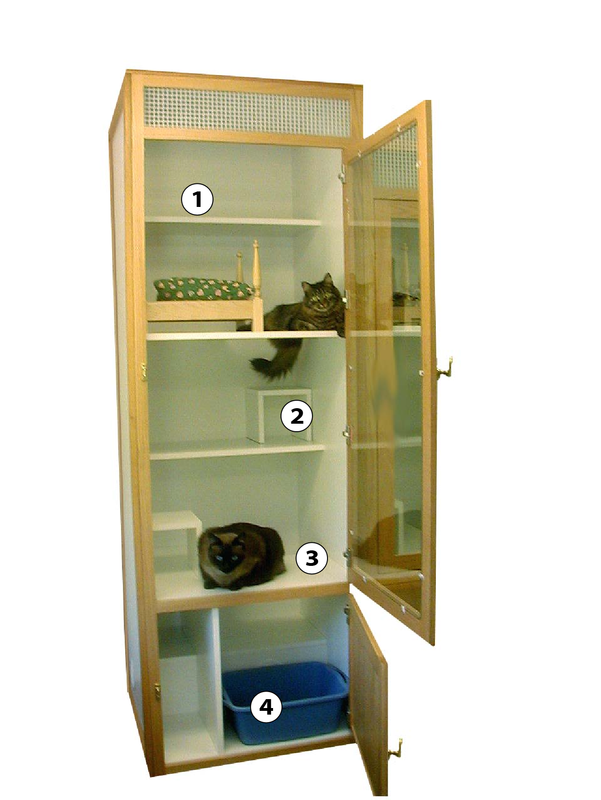 Standing 7-foot-7 in height, the six levels of the cat condo give cats plenty of space to lounge and play. From the top level that gives cats an open look at their surroundings through the tempered glass front panel to the bottom area that includes a secluded hideaway and space for them to do their business privately, the 28 square feet of living space can accommodate up to three cats at once. Included steps make transferring from level to level easy even for kittens or older cats, while the state-of-the-art patented ventilation system (No. 6,318,295 b1) keeps fresh air coming in while removing foul odors and harmful airborne bacteria and disease. Units can even be placed side by side, creating an in-line ventilation for any number of cat townhouses to easily be ventilated in unison. The hardwood paneled exterior is available in oak, cherry or maple finishes, and each unit can be further customized with full glass backing or tinted glass, pass-through doors to allow up to three adult cats to move between connected units or even comfortable accessories like The Cat’s Inn’s four-post cat bed with washable mattress – available in three matching hardwood finishes. 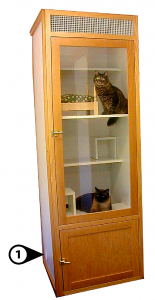 For more information on the hardwood trim cat townhouse or to get a quote, call The Cat’s Inn at 877-228-7466 today! Total of 28 square feet for flat living space. Ventilation duct outlets are located on each side of the townhouse. When placed side by side, this creates one ventilation passage to remove air bourne diseases and odor. 2. Steps make it easy for kittens and older cats to maneuver from level to level. 4 Poster bed in oak, cherry or maple with washable mattress. – view more info on our cat beds.